So with one of the most notable celebrations in the American calendar coming up this month, we wanted to take some time to explain how can you celebrate and enjoy Thanksgiving 2018 if you’re staying with us at DUKES in London this year. If there’s one thing our American guests have taught us about Thanksgiving over the years, it’s that it’s a time to spend with family. A national holiday in the US, the day has a very similar feel to Christmas here in the UK – it’s a day devoted to spending time with family. This is something we’re personally focused on at DUKES. We want everyone to be able to enjoy what’s on offer and so we love seeing families staying with us. We’ve got numerous family-friendly rooms to cater for most family requirements (and even a special family offer that should help please mum and dad!) and our concierge are on hand 24 hours a day, 7 days a week to help you arrange fantastic family activities. But it’s not just at DUKES that you’ll find the focus on family – as soon as you step out into the city itself you’ll find so much to see and do that it’s almost impossible not to have memorable day after memorable day, pleasing the entire family in one go. West End shows that will leave you wanting more. Glorious parks for afternoon strolls. Some of the country’s most historical attractions ready for you to experience. Museums. Art galleries. Theme parks easily accessible with short train journeys. Walking tours. Open air (and closed roof!) bus rides. London is widely regarded as one of the most inclusive cities in the world, and whilst this often refers to race and religion, it just as easily refers to families from right around the globe – if you’re visiting us this Thanksgiving from America, you can be sure you’ll have everything at your disposal for some truly quality family time. 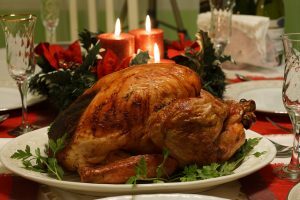 If spending time with family is the most important part of Thanksgiving, overindulging in food has to be the second most important – and there are few better places to be than in London if overindulgence is the aim of your Thanksgiving game! With over 41,000 places to eat within London, there’s no question that there’ll be the perfect place for you and your family to enjoy your favourite food, and it’s more a case of determining which one you choose (given that, based on 41,000 places to eat, it would take 56 years to get through them all if you ate at two a day, every day of the year). Are you looking for high end or budget? Something traditional to Thanksgiving or a complete change? Local to where you’re staying or are you happy to travel? Food is such a big part of London life, it’s no surprise GBR – our ever-popular restaurant – is a key part of our entire DUKES experience. Bringing a modern twist to classic British dishes, the entire restaurant was entirely redesigned recently and as a result, we have everything from intimate booth-style seating through to options for families in their double figures. Wherever you decide to eat, however, it’s the time with family that is key to enjoying Thanksgiving in London. Sit down, tuck in and share those stories you love. Taking place on 22nd November, Thanksgiving is just a few short weeks away and we’re delighted to have guests staying with us who are excited to be enjoying Thanksgiving in London this year. As we’ve said before, London has so much to offer that there truly is something for everyone, and that undoubtedly extends to enjoying Thanksgiving with family. And if you’re staying with us at DUKES this Thanksgiving, you can rest assured we’ll do as much as we physically can to make Thanksgiving 2018 a truly memorable one.